Unless you have been living under a rock in the U.S. you have no doubtedly heard that National Basketball Association top free agent LeBron James has chosen to ‘take his talents to South Beach’. In reality he will be playing home games at American Airlines Arena which is in Downtown Miami (and not South Beach). The Arena sits at NE 6th Street and Biscayne Boulevard. To the South of the Arena is the entrance to the Port of Miami and Bayside Marketplace. Between a block and three blocks to the North of the Arena sit four condominium buildings: Marina Blue, 900 Biscayne Bay, Ten Museum Park and Marquis Condominium. Soon after LeBron James’ signing with the Miami Heat, one of my clients from Switzerland asked if LeBron James’ move would have an impact on Miami Real Estate. My answer was simple – Absolutely! It will be tremendous for the Downtown Miami area. Season Tickets for the home games had immediately sold out. There will be more winning by the team. Additionally there will be more national television exposure for the team and a side benefit would be more exposure for the City of Miami. Think about the aerial video during the telecasts. So far the team is expected to be Nationally televised 30 times (out of 82 total regular season games). That is a huge number and will likely increase as they will be expect to go through 4 rounds of the post season. 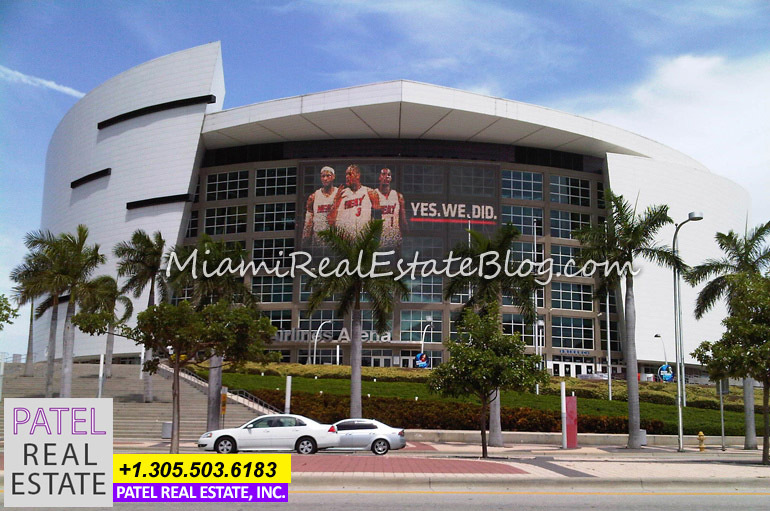 Today it was anounced that 3 retail spaces across from the Arena at MarinaBlue Condominium had been resold. The spaces were purchased by a Sunny Isles Beach investor who paid $2.1 Million for 5,100 square feet. The space is expected to be converted to a restaurant and bar, with possibly a microbrewery. I remember showing a client the full commercial package at Marina Blue in 2008. At the time it was being offered for over $14 Million for roughly 40,000 square feet. Oh do I wish I had a crystal ball back then.